All of his tufts are randomly placed on a vinyl backing sheet which allows easy separation. You can either lift-off one-by-one for individual placement. 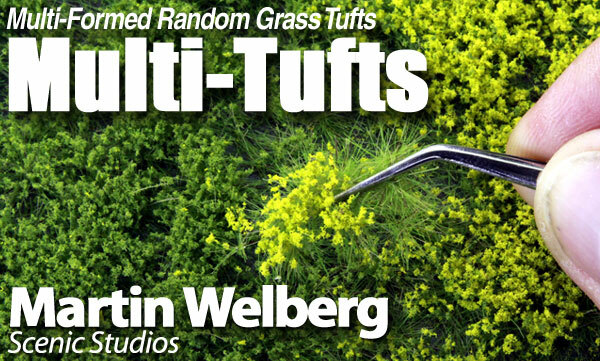 Or, you can reach underneath a grouping and lift-off a random cluster of tufts just like grass tufts grow in nature. All Marten Welberg Tufts vary in diameter. When Martin produces these tufts glue is ‘spattered’ on the vinyl backing sheet making a multitude of small droplets of various sizes. This makes nothing appear mechanical. There may be tufts that are 1/4” in diameter next to one that is 1/8” and that is next to one that is 3/8”. Every sheet is different. The tufts are closely placed together on the sheet so that they are lightly attached to one another and can easily be lifted off as a cluster or large grouping. Sheets measure 5¾" x 8" and contain hundreds of individual tufts. Tufts come in an array of designs. There are 2mm tall sets, 4mm sets and 6mm sets. Tufts also come in Multi-Dimensional Tufts which have multiple height grasses to give a more un-kept rough look. For added texture many tufts have random foam weeds on the top surfaces and some even come in two-tone sets. Far too many to list here. Take time and look at the listing below and find the perfect tufts for your model and diorama. 2mm Spring Tufts - 2mm tall bright spring tone green tufts arranged randomly on a 5¾" x 8" sheet. Use tufts individually or in clusters. 2mm Summer Tufts - 2mm tall Summer green tone tufts arranged randomly on a 5¾" x 8" sheet. Use tufts individually or in clusters. 2mm Late Summer Tufts - 2mm tall late summer multi-tone beige/green tufts arranged randomly on a 5¾" x 8" sheet. Use tufts individually or in clusters. 2mm Autumn Tufts - 2mm tall autumn tone beige tufts arranged randomly on a 5¾" x 8" sheet. Use tufts individually or in clusters. 2mm Golden Summer Tufts - 2mm tall golden-brown tone of late summer. Tufts arranged randomly on a 5¾" x 8" sheet. Use tufts individually or in clusters. NEW! Spring Layered Tufts - Multi-layered, various height, light-green spring tone tufts arranged randomly on a 5¾" x 8" sheet. Use tufts individually or in clusters. NEW! Summer Layered Tufts - Multi-layered, various height, brilliant summer green-tone tufts arranged randomly on a 5¾" x 8" sheet. Use tufts individually or in clusters. NEW! Late Summer Layered Tufts - Multi-layered, various height, late summer green-tone tufts arranged randomly on a 5¾" x 8" sheet. Use tufts individually or in clusters. NEW! 2-4mm Autumn Tone Layered Tufts - Multi-layered, various height with 2mm base layer and 4mm tall dry-grass patches, brilliant autumn tone tufts arranged randomly on a 5¾" x 8" sheet. Random stippled backing allow tufts to be place individually or in clusters. NEW! 2-6mm Late Summer tone Layered Tufts - Multi-layered, various height with tall 6mm dry green grass patches, tan & dry green-tone 2mm tufts arranged randomly on a 5¾" x 8" sheet. Use tufts individually or in clusters. NEW! 2-6mm Autumn Tone Layered Tufts - Multi-layered, various height with tall 6mm grass patches, brilliant summer green-tone tufts arranged randomly on a 5¾" x 8" sheet. Use tufts individually or in clusters. 4mm Summer Tufts - 4mm tall summer tone medium green tufts arranged randomly on a 5¾" x 8" sheet. Use tufts individually or in clusters. 4mm Late Summer Tufts - 4mm tall late summer multi-tone beige/green tufts arranged randomly on a 5¾" x 8" sheet. Use tufts individually or in clusters. 4mm Autumn Tufts - 4mm color tones of dead & dry winter grasses. Set consists of deep tans & brown static grasses. Tufts are placed randomly on a 5¾" x 8" sheet. Use tufts individually or in clusters. 4mm Dry Winter Tufts - 4mm color tones of dead & dry winter Grasses. Set consists of deep tans & brown static grasses Super realistic! Tufts are placed randomly on a 5¾" x 8" sheet. Use tufts individually or in clusters.